September. It was a lovely month. Usually it means no more hot weather…for which I shout hurray. On a Sunday morning walk, I celebrated the charms of North Avenue beach by hanging out for a while at the Chess Pavilion. It’s a beautiful refuge from the sun and my favorite place to take a break on the lakefront. The Chess Pavilion was built in 1957, designed by architect Maurice Webster. Sculptor Boris Gilbertson carved the stone chess pieces and the incised chess figures. September is also the month of Bruce Springsteen’s birthday (the 23rd), which gives me an excuse to post a photo of him looking great at whatever his age is. This year it’s 64. Here’s a photo of him on the beach in Rio de Janeiro, where he played his first South American concerts in many years. And it’s the month of other important birthdays. Like Leonard Cohen (the 21st), who at 79 is still touring, looking fabulous and sounding like his usual charming, gravel-voiced self. He’s sort of a lounge lizard version of Tom Waits. Leonard is still touring on his latest album, Old Ideas. He’ll be in Australia and New Zealand in November. I reviewed his March concert at the Chicago Theater. And it’s also the month to remember the late great John Coltrane, who shares Bruce’s birthday, September 23. If Trane were alive today, he would be 87. His death at the age of 40 was a tragedy and an immense loss to the music world. He was and is today enormously influential to young musicians. He was beginning to experiment with avant-garde jazz (as in his spiritual album A Love Supreme) as well as with eastern religions. Trane’s biography and legacy are complex. He’s been treated as a religious figure by some African-American churches; there is at least one film about the St. John Coltrane African Orthodox Church in San Francisco; and a church in New Jersey includes him on a list of African-American saints. You’ll find some beautiful images and a great Coltrane quote on that church page. And they hold services every Sunday with the Coltrane liturgy. Before going on a Berwyn bungalow tour last week, I was exploring far northwest side real estate to see how bungalows are currently valued. (They are real values, solidly built small houses in pleasant older neighborhoods.) I decided to search for the house where I grew up and was pleased to find a great photo of it from the time of its last sale in 2009. 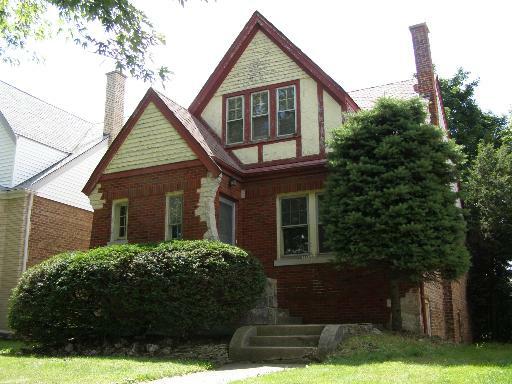 The house is on Rutherford Avenue in the Montclare neighborhood, near the intersection of Grand and Oak Park avenues. My parents bought the house in 1938 and lived there for about 30 years. The standard bungalows in Berwyn all have similar layouts. Small front hall, living room, dining room, kitchen, half bath and sometimes a small bedroom on the first floor. The second floor typically has sloped ceilings in the two bedrooms plus one full bath. These are small houses, typically 1200-1500 square feet. My parents’ house, even though it didn’t have a bungalow façade, had exactly that inside layout. The developer on that block decided to spiff up the exteriors by applying “Tudor” façades. I could draw the floor plan from memory this minute. “Super-bungalows,” are larger and have different space layouts, more bedrooms and baths. We saw a few of those in Berwyn Sunday. The tour is a self-guided walking tour to seven or eight houses, with docents stationed at each house to guide visitors through the interiors. It’s an annual event, so put it on your calendar for September 2014. I recommend it highly. Bruce is looking good at 64. He definitely looks good and his musical skills and performance stamina haven’t declined. LOVED both topics. Simple. Nostalgic. Fun to read. Thanks for your comment. I finally checked out my site in Firefox and didn’t see any problem with the text running off the page. I’m running Firefox 24.0, which I think is the latest version. I’m sorry you’re having that problem, but I hope you will keep visiting.